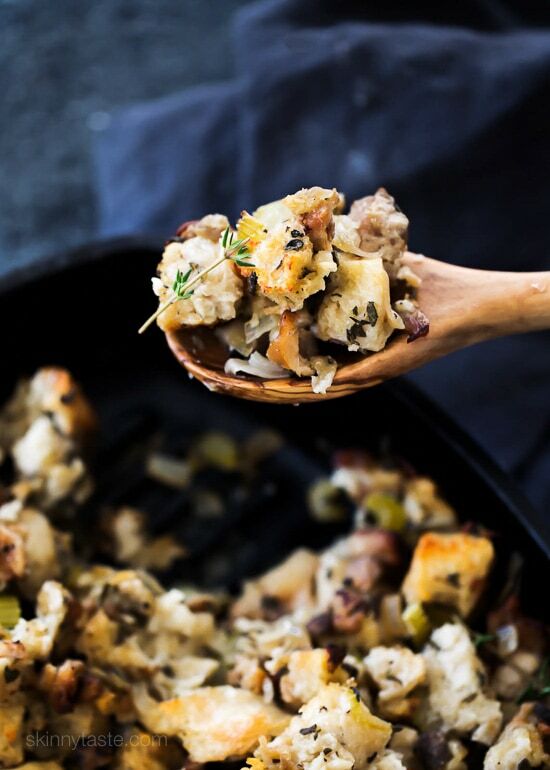 Chicken Sausage and Herb Stuffing – this is the best Thanksgiving stuffing recipe! 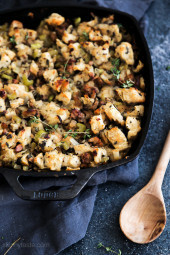 I don’t know about you, but for me the ONE thing I crave most on Thanksgiving is the stuffing! Sure, the turkey and gravy are all great too, and yes, even the cranberry sauce. 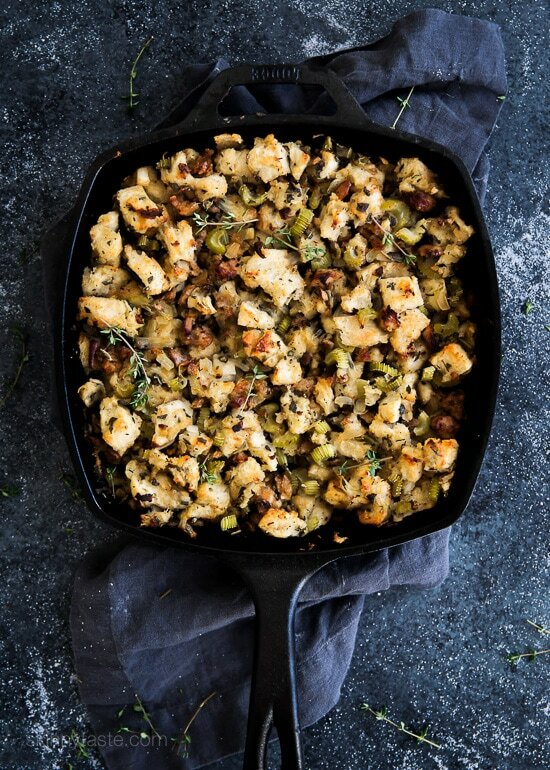 But personally, no Thanksgiving is complete without the homemade stuffing, and this recipe never disappoints! 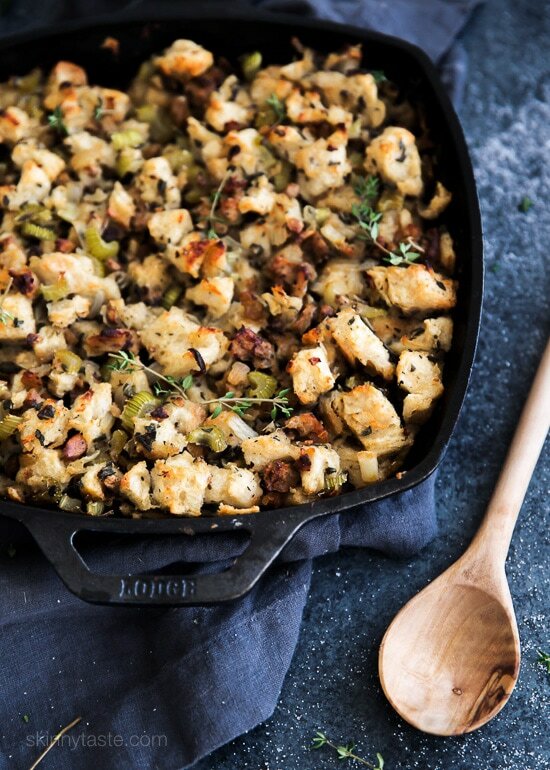 Here are more Thanksgiving Recipes to go with your turkey this year! 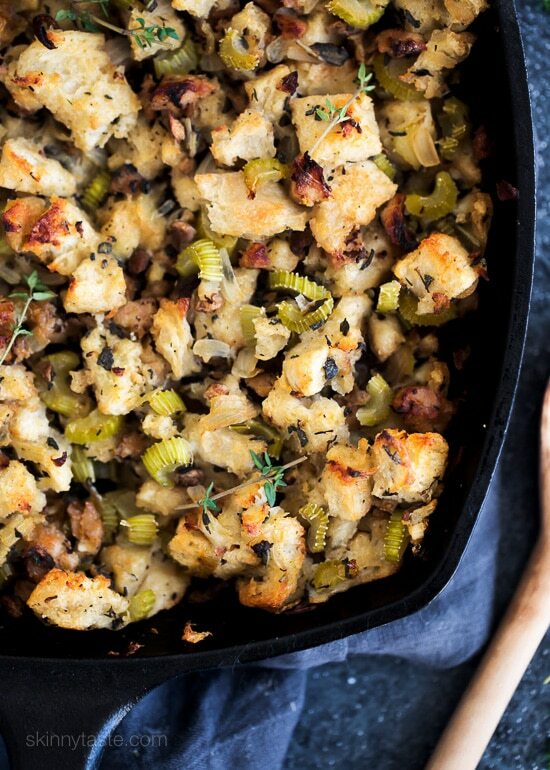 With Thanksgiving around the corner I thought I would revive this amazing stuffing from the archives. If you can’t find a good Italian chicken sausage, turkey sausage would also be great. Leftovers should be good for about 3 days. I buy whole wheat baguettes to make this and cut the bread in cubes the night before to let it sit out and harden overnight. 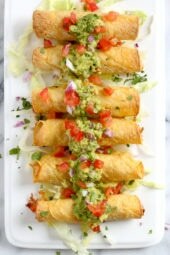 You can also do this in the oven the day of, but I personally like to prep as much as possible the night before. Cut the bread into 1/2-inch cubes. 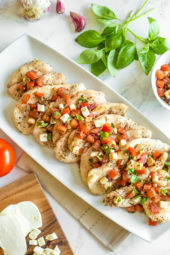 Spread the bread out on a baking sheet and let it dry overnight – OR – place the baking sheet in a 350°F oven and bake about 20 minutes, or until the bread is dried out. Set aside. Preheat oven to 375°F. Spray a large baking dish with oil. In a large sauté pan, melt the butter over medium heat. Add the onion and celery and sauté, stirring occasionally, until tender and translucent, about 8 minutes. Transfer to a large bowl. In the same pan over medium heat, cook the sausage, crumbling with a wooden spoon, until lightly browned and cooked through, about 10 minutes. Transfer the sausage to the bowl with the onion/celery mixture. Add the bread, sage and thyme to the bowl with the sausage/onion mixture and stir to combine. Add the chicken broth and stir to evenly coat the bread. Adjust salt and pepper to taste and stir to mix well. Transfer to the baking dish and bake for 30 minutes. Using a wooden spoon, gently stir. Continue baking until golden, about 30 to 35 minutes more. Serve immediately. Good flavor…not a bad dish. However, this was not the flavor profile I was hoping for for Thanksgiving Dinner. It reminded everyone of italian/pizza with the italian sausage and didn’t compliment other dishes well. 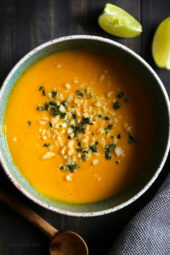 The flavor was great, but there was way too much liquid in this recipe. I only used 2 of the3 1/4 cups of broth that the recipe called for, and the mixture was swimming in liquid! I drained some of it off, but it was still real soggy. I used homemade French bread and I weighed it after I cut it into cubes. I used smoked chicken and apple sausage because I couldn’t find sweet Italian chicken sausage. I would definitely make this again, but just cut the liquid back by at least half.